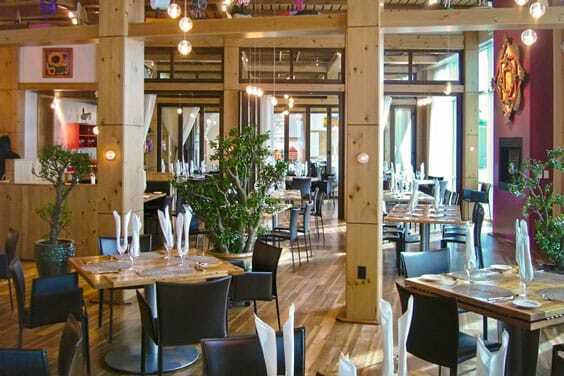 From the garden level “tavern” feel of its original quaint Cherry Creek location, Chinook Tavern has moved up by moving south - to the Village Center Station by the Arapahoe Light Rail station in Greenwood Village. Owner Clemens Georg said he toyed with the idea of dropping the “tavern” from the name to better reflect the elegant and eclectic ambiance of the very spacious, open floor plan of the new restaurant. More than twenty years of word-of-mouth endorsements and an already-established loyal customer base convinced him the name should remain unchanged, although much of the restaurant’s look and feel had changed. 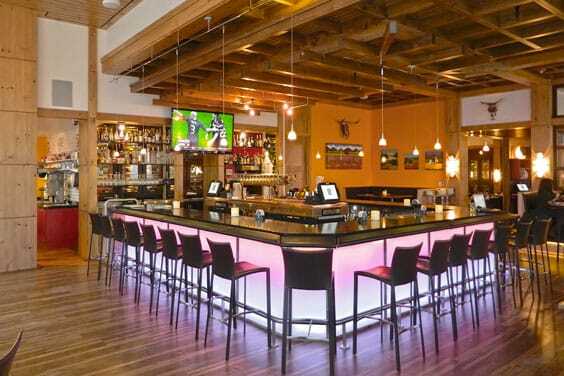 One would never guess, based on the sophistication and “art gallery” feel of the open floor plan restaurant, that Chinook Tavern is the family owned and operated labor of love, rich with European heritage, that it is. According to Georg, his father was the creative designer and architect who brought the look and feel of the restaurant together, his mother was responsible for painting the vibrant and colorful art hanging on the walls, his brother is the executive chef, and Georg runs the place. Upon entry, the bar invites a lively social scene and is uniquely designed in the shape of a horseshoe, allowing prime viewing of the entire restaurant from the bar patrons. “Why should the bartender be the only one with a good view?” chuckled Georg. Happy hour at Chinook Tavern is a great place for get-togethers, time with friends, and a great way to sample its version of appetizers, called “rush bites.” Ranging in price from $5 to $11, some of the more interesting rush bites include the Chinook charcuterie board (assortment of meats and cheeses), baked escargot, crispy calamari, baked Bavarian style pretzel, fried short-rib ravioli, steamed Prince-Edward mussels, fried Brie, and almond-crusted shrimp cakes. If relaxed dining is the agenda for the afternoon or evening, enjoy the casual, yet very elegant atmosphere of the expansive dining area and indulge in some of the areas best contemporary European cuisine. Come and create your very own culinary work of art with Chinook’s fondue and Raclette experience in the Zermatt room. Raclette, originating in Switzerland, is an entertaining way of dining. With endless choices and combinations of grilling your own bite size meats and vegetables, while melting the Raclette cheese under the grill and then dipping it in Chinook’s own tasty dipping sauces, this is a dining experience that promises to be creative and unique. A broader sampling of the menu includes classic German wiener schnitzel cooked to perfection; quinoa-roasted vegetable piperade mixed with seasonal vegetables, almonds, cranberries, goat cheese and crème fraiche; baked wild mushroom strudel; jalapeno-infused tequila house-cured salmon; apple wood grilled porcini dusted beef tenderloin; or pan-seared coquilles and iberico wrapped crevettes. End any meal with the “Rote Gruetze,” (German red berry dessert) - a scrumptious combination of boysenberries, raspberries, sweet and sour cherries, with a blanket of crème anglaise on top. Chinook also features a beautiful private dining room that can seat up to 110 guests. It overlooks the outdoor terrace (with inverted umbrellas), where guests host special events such as rehearsal dinners, charity events, and office celebrations. Chinook Tavern is located at 6380 South Fiddlers Green Circle at the Village Center Station, a stone’s throw from the Arapahoe Light Rail station. 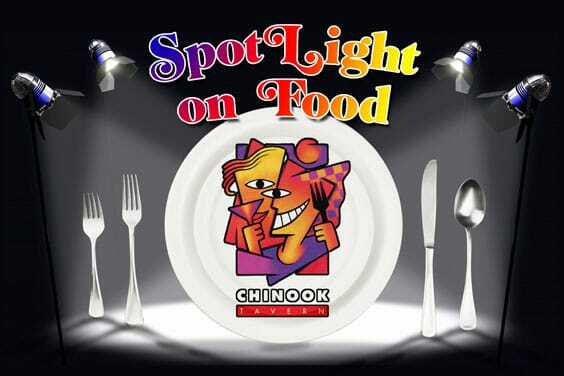 For more information, hours of operation, and reservations, call 720-266-6000 or visit www.chinookdenver.com. The bar envites a loud, vibrant social scene and is a uniquely designed in the shape of a horseshoe.